Brand new to Mankind! Closed on Monday champion the art of British barbering and gentlemen's hairdressing in each and every product. Discover the collection at Mankind and enjoy the versatile range of hair styling and male grooming products today. Designed and manufactured in Britain, Closed on Monday is a male grooming range which delivers high quality hair styling products and skincare for men. Closed on Monday products are scented with a mild Sandalwood and Vetiver fragrance; making each product deliciously fragrant with a masculine edge. Hair pomade is the perfect styling addition to your haircare routine. The Closed on Monday Hair Pomade offers exquisite hold and easily transforms your hair style every day. For effortless styles with superb hold, simple warm the pomade between your fingers and tease your hair to the shape you need for the occasion. 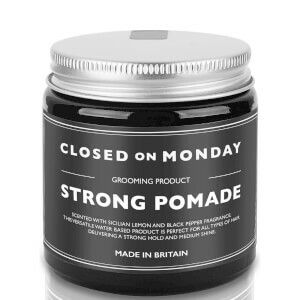 Closed on Monday pomade offers a medium hold and gives all mens hair a lustrous shine with every use. Scented with sandalwood, the subtle scent is perfect for complimenting your favourite aftershave, ensuring your grooming routine is consistent from head to toe. Closed on Monday Beard Balm is perfect for anyone looking to tame and soften their facial hair. An easy to use oil based balm offers superior hold to your moustache and beard style, whilst softening stubble and hairs to avoid any discomfort caused by brittle and harsh facial hair. Enjoy all Closed on Monday products here at Mankind.